Several months ago, I spoke to a large group of military officers and contractors. My topic was “How to Shave Ten Hours Off Your Work Week.” In my speech, I provided seven tools for achieving greater productivity and restoring work-life balance. My fifth suggestion was to “schedule time to actually work.” This is one of those ideas that seems so obvious when you say it out loud. However, it is not widely practiced, I can assure you. Yes, indeed. Imagine actually doing your work—at work, rather than dragging it home to do in the evenings. In order to do this, I simply schedule blocks of time called “Office Work.” These are essentially appointments with myself. I reserve this time for working on routine tasks or important projects. The bottom line is this: if you don’t have a plan for your time, someone else does. The first one to claim it wins! Knowing this, I use Sunday evenings to review my upcoming calendar as part of my weekly review. In the process, I make sure that I have blocked out sufficient time to actually do the work I have agreed to do in all the other meetings I attend. The commitment is, of course, to myself. 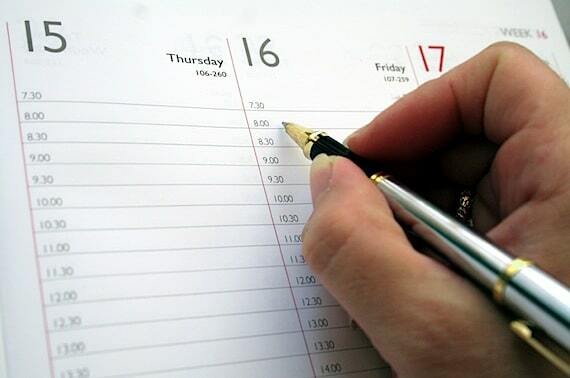 Questions: Have you ever tried scheduling time with yourself? How has that worked for you?